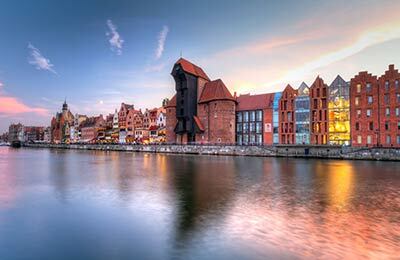 Gdansk is Poland's principal seaport and is a major international transportation hub. It is situated in the central part of the southern Baltic coast at the mouth of the Motława River and is the capital of the Pomeranian Voivodeship. With AFerry you can book ferries from from Gdansk to Nynashamn which is about an hour's drive away from Stockholm. This cheerful maritime city owes its present grandeur to a thousand year of Polish-German history. The beautiful Old Town features the largest brick Gothic church in the world. The city is also the home of of former Polish president and Nobel Peace Prize winner Lech Walesa. In 1980 the city witnessed the birth of the Solidarity movement which brought the end of Communism across Eastern Europe. The port of Gdansk is situated in the central part of the southern Baltic coast at the mouth of the Motława River and is the capital of the Pomeranian Voivodeship. 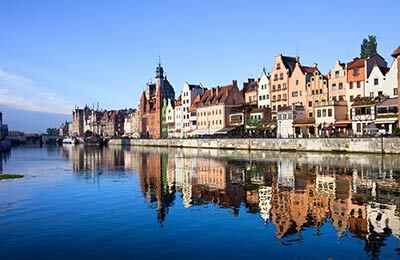 Gdansk is Poland's principal seaport and is a major international transportation hub. Gdansk port is the maritime gate of East Central Europe. With AFerry you can book ferries from from Gdansk to Nynashamn in Sweden which is about an hour's drive away from Stockholm. The Polferries ferry terminal in the port of Gdansk is a fully featured, state of the art ferry terminal featuring all the necessary amenities for your journey. Polferries also provide services including tourist information and ticketing services at the port. Gdansk is well connected to the rest of Poland by the E75 motorway and road numbers 1 and 7. Travelling to and from Gdansk port by car is simple and convenient and is probably the easiest way of reaching the port. Gdansk Ferry Terminal is close to Gdansk train Station which is well connected to the Polish rail network. Tram 13 runs from the Main Railway Station to the bus stop Gdansk-Brzezno with a journey time of about 25 minutes. Here, you have to change to tram 15 and after about 4 minutes get off at the SKM tram stop which is approximately 200m from the Ferry Terminal. Trams run every 10 to 20 minutes. For more information on Poland see our Poland guide.